I just love roasted Brussel sprouts. There was once a time I hated them, but this recipe converted me. Ever since then, I have been roasting Brussel sprouts any way I can. This is my latest roasted Brussel sprouts recipe. This time I added sweet potato. Another one of my favorites! 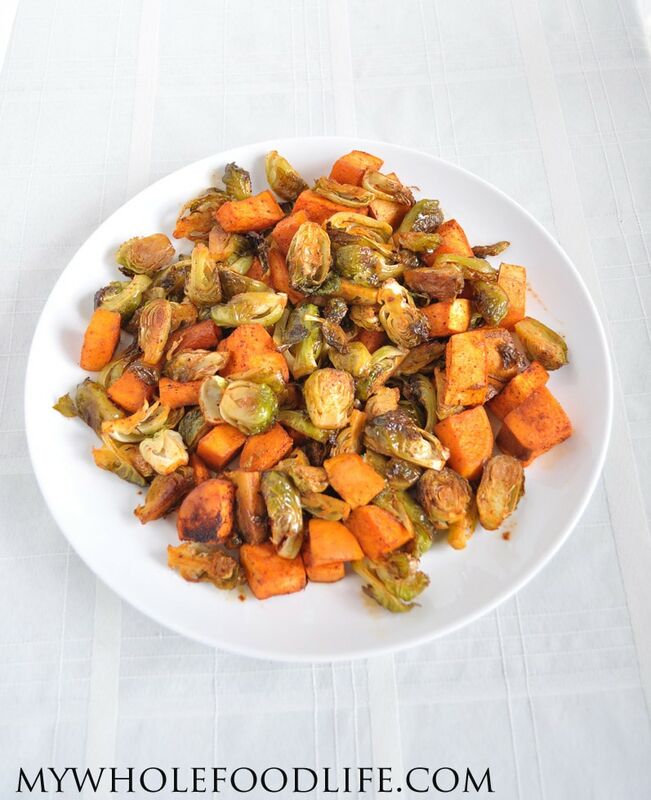 These Smokey Sweet Potato Brussel Sprouts were seriously amazing you guys! When I ate them, I also added some pecans and avocado. So good! I will be making this again for sure. This recipe would be great as a side dish. You could also add your favorite protein to make it a complete meal. Here is a quick video tutorial on how to make this recipe. For more videos, you can subscribe to my You Tube Channel. A super easy side dish! Add the cubed sweet potato and the quartered Brussel sprouts to a bowl . Add the remaining ingredients and mix all the vegetables well so they are completely coated. Spread the vegetables onto a lined baking sheet . Bake for about 30-40 minutes, stopping halfway to stir the vegetables around. This recipe should last at least a week in the fridge. Enjoy! YUM - this sounds awesome and simple! Love smoked paprika and your addition of avocado. Brussels sprouts take on a whole new identity when roasted, don't they!? Can't wait to try this combo! This recipe sounds great. My question is this.....can frozen sprouts be used here, and if so, how do you cook them? Thanks! Thank you! I have never used frozen sprouts before. I am guessing they could work. Maybe let them defrost on the counter and then use them in this recipe? Just a guess. Eating this right now! It is delicious! Thanks for the recipe! So glad you liked this one Alma! Delicious! I doubled the sauce mixture and used 2 pans because I had a lot of veggies. I was excited my 1 year old ate the brussel sprouts! And she loves sweet potatoes so she gobbled them up too of course. I will try this sauce again on other roasted veggies too, such as asparagus, green beans, or potatoes/carrots/parsnips. Thanks for the great recipes! Thanks Jill! Glad it was a hit!